Fruux is a popular third-party CardDAV server. As such, you can connect to it with BusyContacts for contact syncing and sharing. BusyContacts can connect to Fruux, using it to sync contacts across your devices and share them with others. BusyContacts can use Fruux to sync contact data across your devices. Choose BusyContacts > Preferences > Accounts. Click the + (plus) button to add a new account. Choose Fruux from the Server Type pop-up menu, enter your Fruux email address and password, and click OK.
BusyContacts enables you to share address books with other Fruux users. Once each user has configured BusyContacts to sync with their personal Fruux account, you can then share address books with each other through Fruux. When an address book is shared through Fruux, contacts can be edited by any user and changes sync between them. Control-click the address book in the left sidebar and choose Get Info from the contextual menu. Click the plus (+) button and enter the Fruux email address of the person you want to share the address book with. Select “Allow Write” if you want them to have read-write access, or deselect it to give them read-only access. Click OK. BusyContacts begins syncing with Fruux and an icon appears next to the contact name indicating that it is shared. The person(s) you shared with will receive a notification from Fruux inviting them to add the shared contact. If they accept, the shared contact appears in the left sidebar. 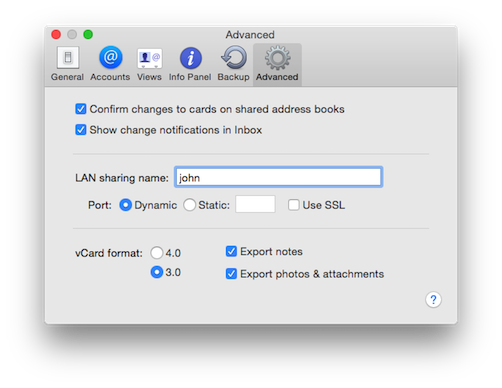 First, in BusyContacts > Preferences > Advanced, select “Confirm changes to cards on shared address books” if you want to display a warning when you edit or delete an event on a shared address book. Second, in the address book Info dialog for any given address book (which you can display by double-clicking the address book name in the address book List), select “Show change notifications in Inbox” to display a badge on the app icon and a message in the Inbox when contacts are added or changed by others, or deselect it to avoid seeing badges and Inbox notifications for that address book. Click OK to dismiss each message in the Inbox. 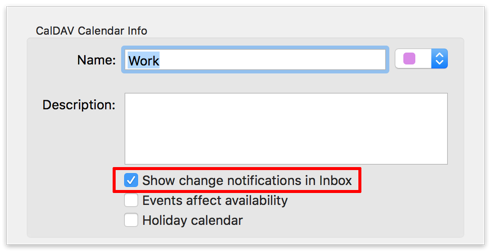 Or, hold down Option and OK changes to OK All, enabling you to dismiss all messages with a single click.